Before I watched this, I was told that it was all about baseball, money and statistics, but that it doesn’t matter if you don’t know about the sport because it’s a good story. That’s a load of baloney. There are some things that you need to know about. Like, for example, in baseball players can be traded or dropped anytime during the season. That’s pretty crucial. Plus, there’s a whole of technical sport talk that I don’t know about, and really don’t care about. All of this made for a pretty boring film for me. 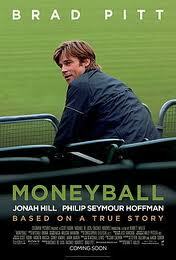 Brad Pitt plays Billy Beane, who organizes the buying and selling of players for Oakland A. He encounters Peter Brand(Seth Rogan) who is a new, young guy working for a rival team. Beane can see the value of the thinking of Brand, and so buys out his contract and between them they try to change the way people think about baseball. Sound interesting? Perhaps it might be to you. I can’t fault the performances at all, but as far as subject matter and scripting is concerned, I was just totally lost. Moneyball was nominated for Oscars for Best Acheivement in Film Editing, Best Actor in a Leading Role (Brad Pitt), Best Actor in a Supporting Role (Jonah Hill), Best Sound Mixing and Best Writing, Adapted Screenplay.